I’m a fan of spontaneity and random romance and catching the eye of your crush across a room. I’m not a fan of corny cards and cheap chocolate and ridiculous expectations. In short, while I do love love, I’m not a fan of Valentine’s Day. Don’t get me wrong, I adore a heart shaped cookie and bright red cake as much as the next person but the pressure and expectations and commercialism of February 14 bothers me. So it is not particularly surprising that on this day I give you spice and heat instead of sugar and frills. 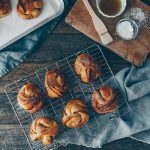 Now did you know that for the first four months of this blog there wasn’t a single recipe post? 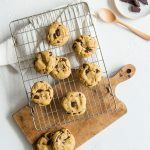 There was a bit of food, a few random observations, and one fashion rant that still gets hits from Google – although it’s probably not quite the encouragement people are looking for when searching ‘tanks with big arm holes‘… but no recipes. 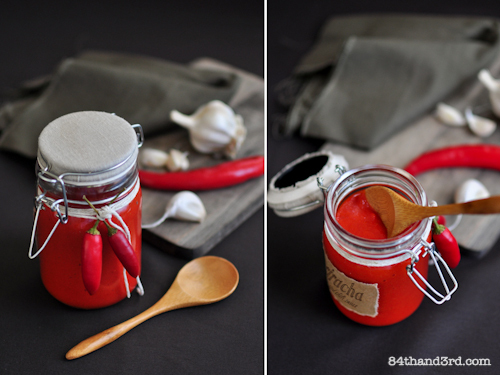 Then two years ago on this very day my first creation appeared – Spicy Chili Sauce in honour of St Valentine. Last year I kept with the spice theme but in the form of a Spiced Cherry Pie and a nod to Lupercalia. 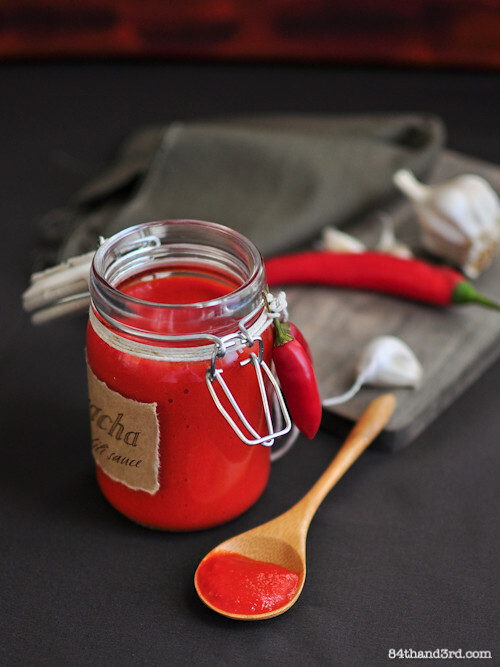 And now another Valentine’s Day has rolled around and I figured it was the perfect opportunity to not only tweek my Sriracha recipe slightly but post new photos. Then, during the preparation of this post and lets be honest, in a fit of procrastination-driven-creativity, I found myself searching for a quote about love and spice. I wandered aimlessly through the internet before getting lost in Story People. I read and re-read the stories one by one, remembering how RJ and I would leaf through the books in the very early days of our relationship and laugh at the raw, insightful sayings and whimsical drawings. A good friend even gave us this one for a wedding gift. But still no quote about love and spice could be found. 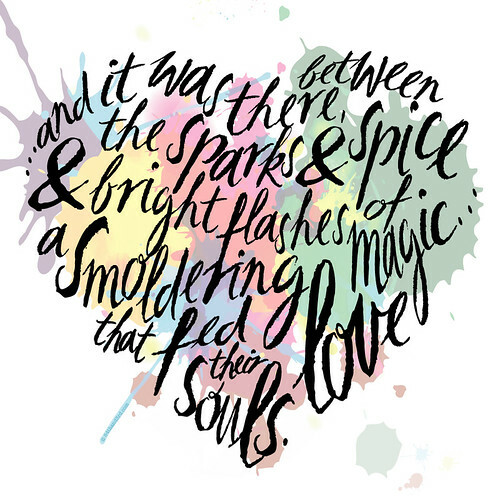 …and it was there, between the sparks & spice & bright flashes of magic… the smoldering love that fed their souls. With that, whether you love or loathe Valentine’s Day, I hope your life is full of heat and passion and brilliant surprises. And lots of chili sauce. Now please excuse me while I go catch RJ’s eye across a room, I still have a crush on him after all these years. You can make this sauce as mild or spicy as you wish. Go big to give a real kick to raw oysters, Asian soups and slices of green mango; or go a bit less intense and coat chicken wings before barbequing over hot coals. Either way, share it with someone you love. Cut carrot into batons and steam until soft. 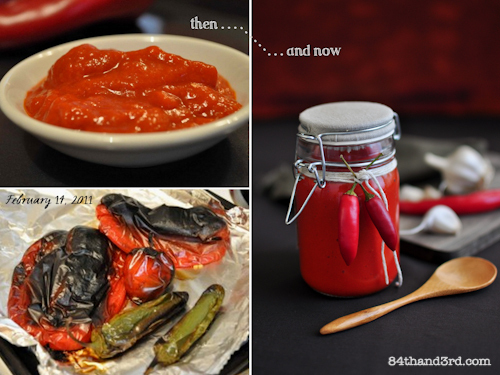 Blacken all sides of red capsicum on foil under grill [broiler]. Once charred, wrap in foil to steam. Blacken chilies, two garlic cloves and steamed carrots on foil under grill. Once charred, wrap in foil to steam. Peel all peppers and remove seeds – do not rinse. Peel fresh and roasted garlic. Puree all ingredients until smooth. 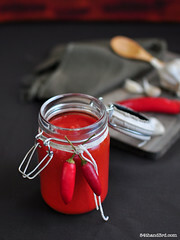 Tip: Keep some of the chillies, vinegar and salt out initially, and add to taste. Cut carrot into batons and steam approx 15 mins until soft when poked with a fork. Place whole red capsicum on a foil lined baking tray. Char under a medium-high grill [broiler], turning every few minutes to blacken all sides*. Remove from oven and wrap in the foil to steam until cool enough to touch. Using a new piece of foil, repeat with chilies, two garlic cloves and carrot batons to just blacken all sides. Wrap in the foil to steam until cool enough to touch. 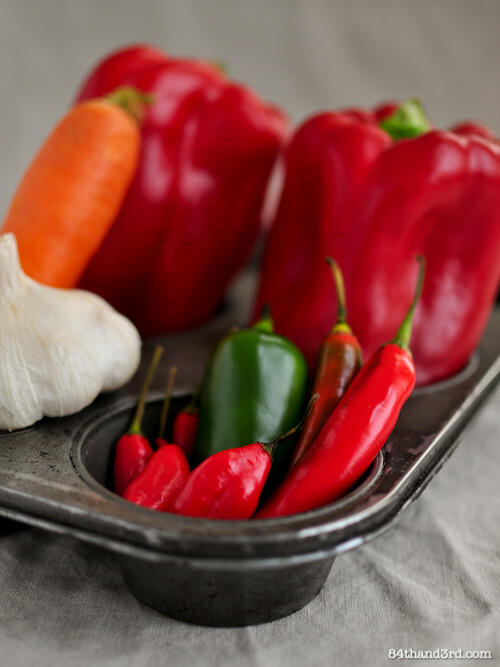 Peel skins off capsicum and chilies, pull out stems and remove seeds – do not rinse under water, it will wash away all that lovely flavour. You will want to wear gloves when handling the chillies, trust me on this one… Peel roasted and raw garlic cloves. 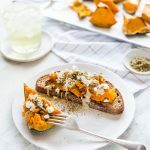 Place all of the carrot, garlic, capsicum and half the chilies into a food processor or immersion blender jug along with any juices collected during peeling. Add half the vinegar and half the salt. Puree until smooth. Taste and add additional roasted chilies, vinegar and salt to taste, puree until smooth. Makes approx 2 c sauce. 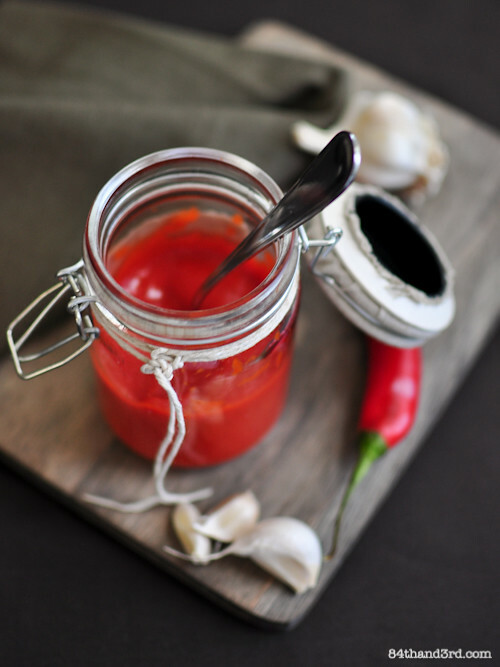 Store some in a sterilised jar in the fridge, freeze the rest in small portions and defrost as necessary. When blackening capsicum you want to just char the skin but not completely disintegrate the flesh underneath. Turn as each flat side darkens. Wrapping and letting them steam after will help all the skin to release very easily. Chillies are much more delicate so turn just as they get a bit dark and puffed, there is generally no need to let them go completely black. If you want to do this over an open flame and really make it a fire roasted sauce, go for it, just watch your eyebrows. A funny thing happened on the way to the cleanup. I was portioning this out to freeze and looked down at the jar, half empty with one of our everyday spoons sticking out. It just worked, so back to the table it went and this is what I ended up with. I think it may be one of my favourite shots of the day. Isn’t that always the way. What a great condiment, I love the color! Cheers Laura, every time I make it I’m surprise how brilliantly (luridly) red-orange it comes out! Yeah, I can already see some girls in an office, keeping one eye on the door and waiting for a flower courier to walk through with a box of roses. Yawn. 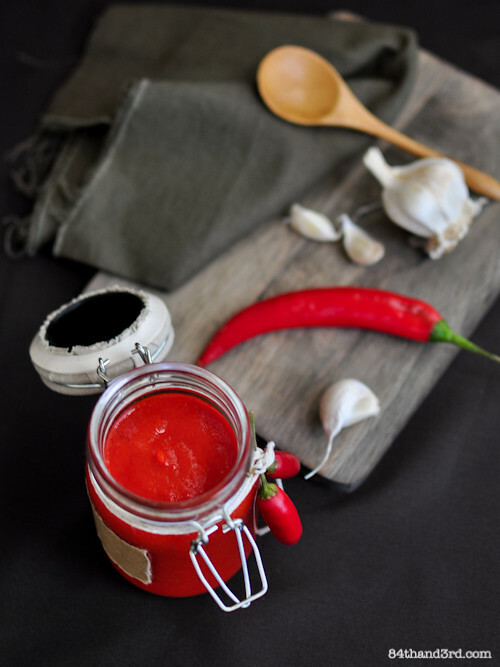 A jar of chilli sauce is so much more exciting! I love sriaracha. I’ve eaten it with nearly every dinner meal at home and can’t live without it. And I cannot believe you made your own! WOW! I am so impressed. 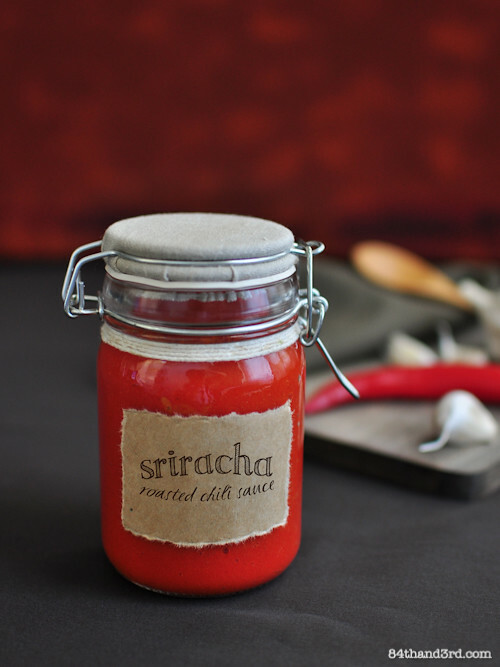 I haven’t been able to find sriracha in my neck of the woods! Yippee for the recipe, now I can make my own. Easy-peasy method and it will be fresh to boot!! Thanks heaps! Am the biggest romantic in the world, but red roses because of a date: no thanks !!! Exactly, hope you enjoy the sauce! Yes I so know what you mean about the whole HYPE of valentines day! Chilli sauce is way better than a box of chocolates in my book! I’m so torn with Valentine’s Day. I really hate how commercialised it is but at the same time I love an excuse to be extra indulgent (we’re having chocolate mud cake for dessert on a Thursday!). Really I’m a walking contradiction. I’d quite happily receive a jar of chili sauce! 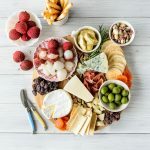 I’m with you – any excuse for indulgence is a good one 😉 And homemade negates a bit of the hype, right?! Look at that intense colour! AMAZING! Thanks for the recipe, I’ll have to make it some time. I’m on the same boat as you, I love love but don’t like the commercialism of Hallmark Day. Instead of buying cards and buying gifts, I like to make them, comes from the heart. Hehe snap JJ! I also made chilli sauce-it must be all of the gorgeous chillies at the moment 🙂 Yours looks divine and love the packaging! Beautiful! 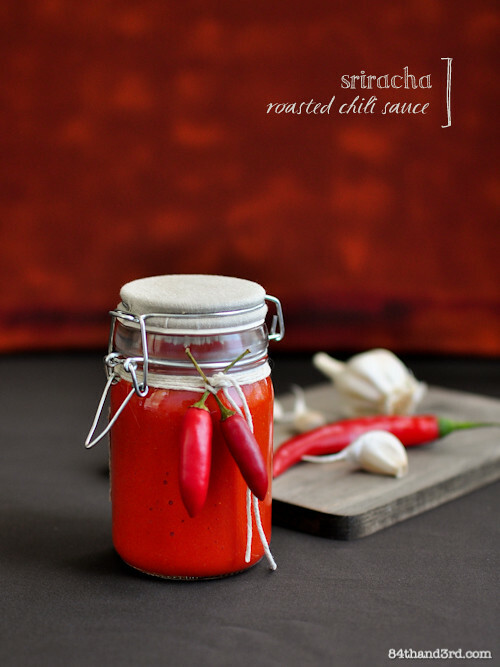 I think I may need to make this with my beautiful, full red chillies growing in my garden at the moment 🙂 Just a beautiful post! Your writing and your cooking and your creations all amaze me. And the poetry…wow!! !Lady of many talents. Loving the colour and recipe JJ! Much better than flowers for sure! How is that gorgeous colour of the sriracha. Something I have never even contemplated attempting to make at home. Why? Not sure. I agree with you regarding your Valentine sentiments.